Discovered in 1911, superconductivity is a phenomenon in which certain materials, at very low temperatures, become essentially transparent to electricity: Their resistance drops to zero and electrons can flow freely, with perfect efficiency. However, for most of the 20th century, superconductivity was only observed at extremely low temperatures, just a few degrees above absolute zero. From 1973 on, physicists had not been able to induce the phenomenon at temperatures higher than 23 degrees Kelvin. Then, in 1986, a number of researchers achieved breakthroughs with new materials. K. Alex Müller and J. Georg Bednorz at IBM’s Zürich Research Center discovered a new class of ceramics, known as perovskites, that became superconductive at 30 K. “I celebrated this with one or two beers,” Dr. Bednorz told The New York Times later. Other researchers in Tokyo and Beijing confirmed the Swiss results, and then in February 1987, American physicist Paul C.W. Chu demonstrated superconductivity at 93 K (minus 283 degrees Fahrenheit), or 16 degrees above the boiling point of nitrogen. While still very cold, the finding was a significant breakthrough, because it meant that relatively inexpensive liquid nitrogen — which is cheaper than beer — could be used to cool superconductors. It opened up the possibility that these unusual materials might find practical applications, such as powerful magnets for mag-lev trains or superefficient power transmission lines. Chu’s paper was published in the March 2 issue of Physical Review Letters . It was just a few weeks before the annual meeting of the American Physical Society, and interest in the subject was so high that organizers hastily threw together a session on the topic, starting at 7:30 p.m. on March 18. 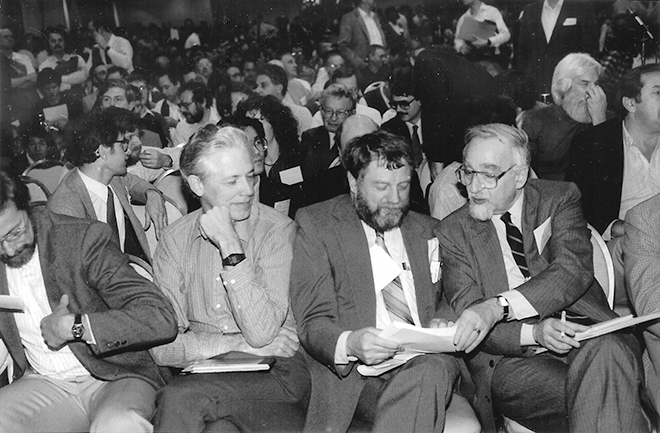 Eager physicists lined up as early as 5:30 p.m. for the session, and eventually more than 1,800 physicists crammed into a ballroom meant for 1,100. An overflow crowd of 2,000 more watched the proceedings on television monitors. The session, with 51 presenters, went until 3:30 in the morning. “It was an electrifying event,” deadpanned Philip F. Schewe, a science writer who was there, according to the Times . And indeed, high-temperature superconductors captured New York City’s and the nation’s imagination for a short while. Visions of levitating trains and supercolliders danced in the public’s mind. Scientists found that their APS badges got them into Chelsea nightclubs for free. Newspapers wrote about superconductors. Funding for superconductors surged. But most importantly, the breakthrough opened new avenues of inquiry into a phenomenon that is still a bit of a mystery.